King David knew a thing or two about heartache. Whether it was being overlooked by his father when he was a shepherd boy, being chased down by a murderous father-in-law or publicly exposed for his deadly secret sins. In the midst of his own personal pain and suffering, David discovered that God was very close and was always ready to save those with a contrite spirit. 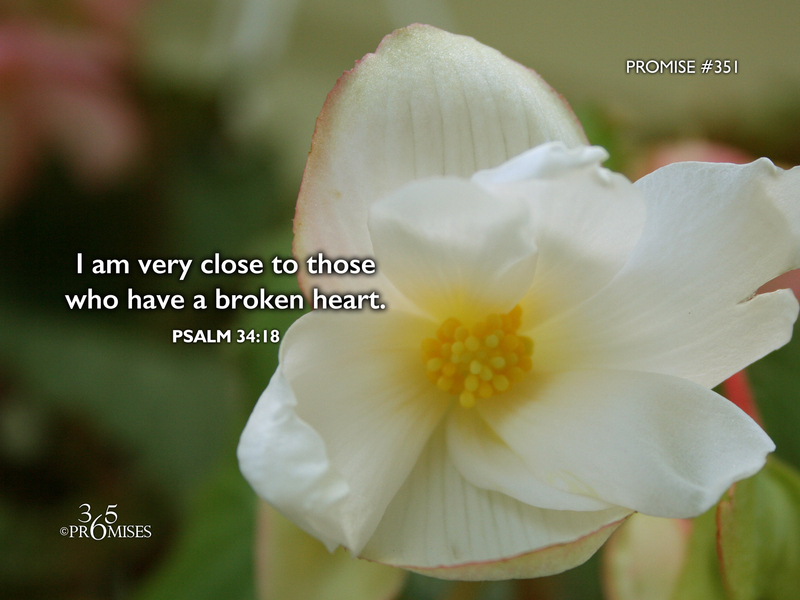 If God is indeed close to those with a broken heart as David said He was, what does that mean for us today? With all of the horror that goes on in the world, I can only imagine that our God and Father is walking alongside every brokenhearted person on the planet whether they are aware of His presence or not. I don't think this idea is too much of a stretch because in Acts 2:17 we read that at Pentecost God poured out His own Spirit on all people. So if that is indeed the reality, God is closer that we could possibly imagine. In some Christian circles though, we are afraid to expose our own personal brokenness for fear of being judged. Yet it is David, called 'a man after God's own heart', who wrote Psalm 34. If you read David's life story, you will know that he was not speaking in a hypothetical context, but right out of his own life experiences. No matter what depth of despair you might be contending with in your own life today, may this promise encourage you that your Heavenly Father is very near.